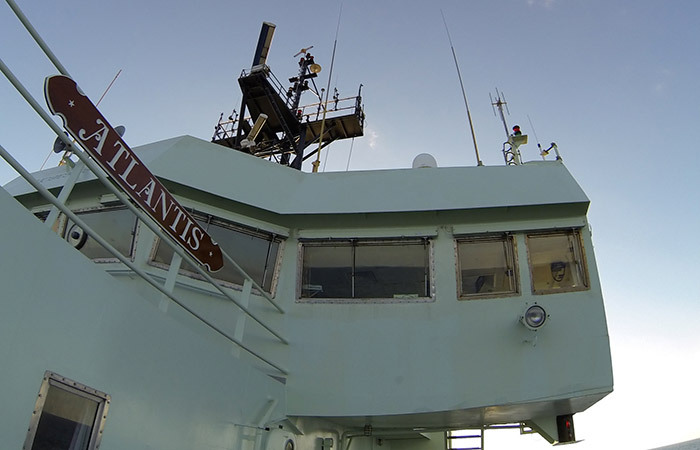 In January 2014, I spent four weeks living at sea on the R/V Atlantis as a correspondent for Woods Hole Oceanographic Institution’s “Dive and Discover” program. Over the course of the cruise, I created daily dispatches, photo slideshows, Q&A pieces, interviews, and video clips, allowing viewers around the world to follow the team’s research in real time. Middle and High School students in particular used the Dive and Discover website extensively and were invited to send questions directly to researchers. 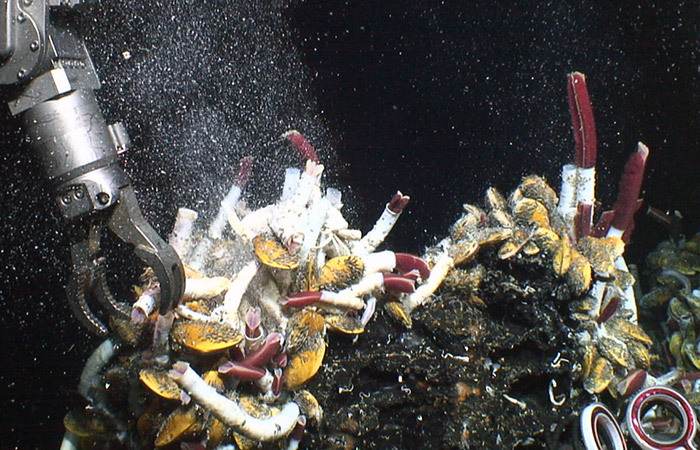 This expedition, which involved scientists from almost a dozen different countries, took place at the East Pacific Rise, a cluster of hydrothermal vents in the Pacific Ocean roughly 1,000 miles west of Panama. 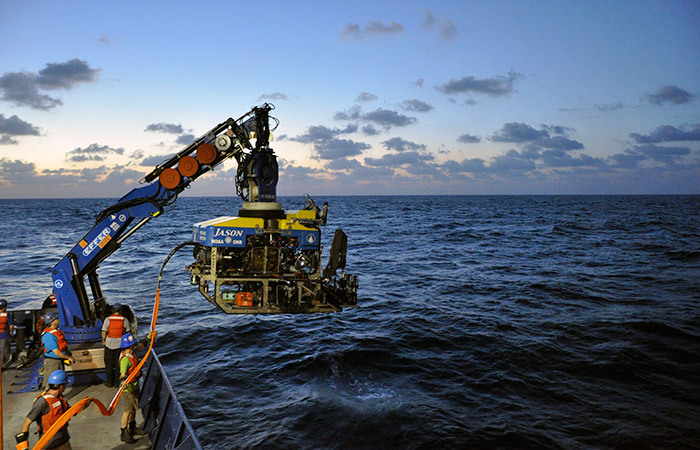 Once there, the science team used the remotely operated vehicle Jason to collect samples on the ocean floor more than 8,000 feet below. Their goal: to study the inner workings of microbes that live at the vent sites, forming the base of the food chain for organisms that live nearby. Unlike most microbes on land, these species can survive entirely on the chemicals that percolate out of the ocean floor, a rare ability in the microbial world. Members of the expedition's science team watch as an elevator containing samples from the vents below is recovered from the water. 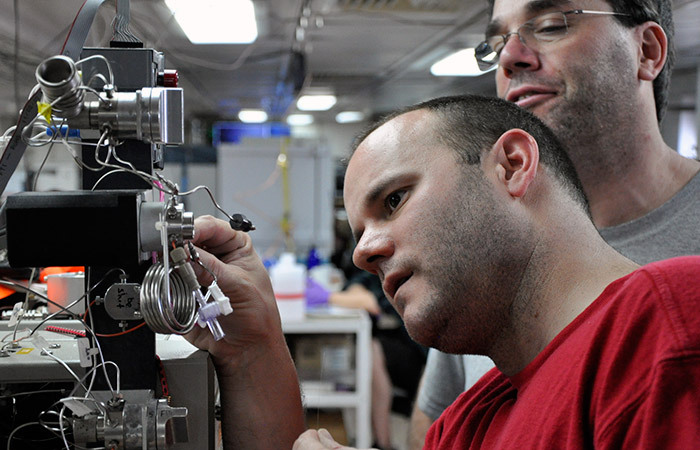 WHOI researchers Sean Sylva and Jeff Seewald troubleshoot a blocked valve in a gas chromatograph, an instrument they use to analyze the gas content of vent fluids. 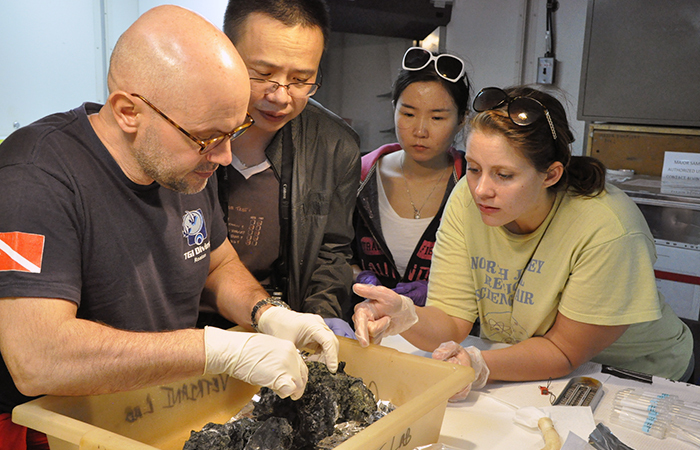 Left to right, Costa Vetriani, Xiao Xiang, Xi Wei, and Ashley Grosche gather around pieces of a hydrothermal vent structure collected by Jason. The samples arrived at the surface minutes before this photo was taken. 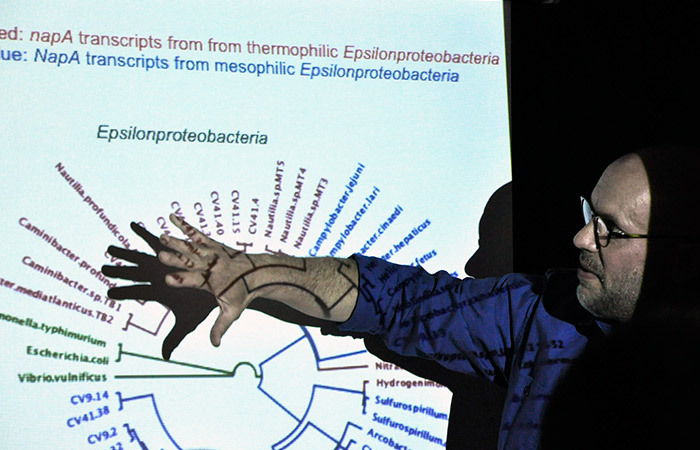 During a presentation to the scientific team, microbial biologist Costa Vetriani gives an overview of the bacterial species he plans to study on this expedition. 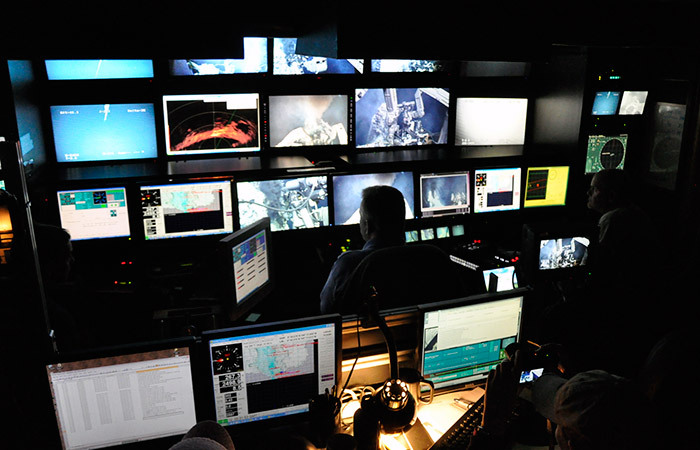 Inside the Jason control van, dozens of video screens display images sent from the ocean floor 8,000 feet below. 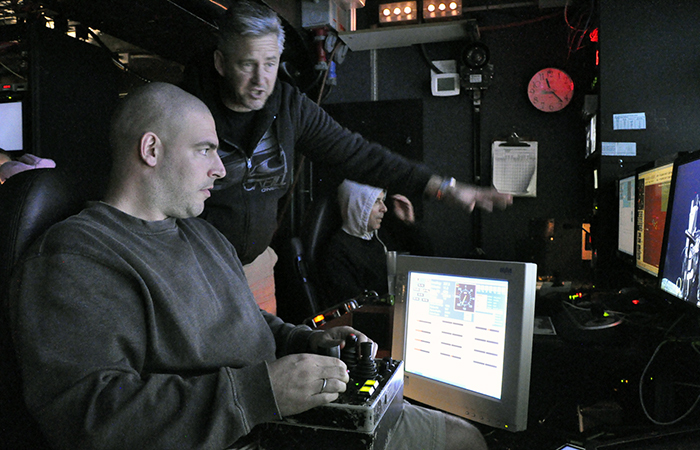 During a night shift in the Jason control van, Expedition Leader and Pilot Tito Collasius (center) gives postodoctoral researcher Donato Giovannelli (left) a chance to “fly” the remotely operated vehicle over the ocean floor. 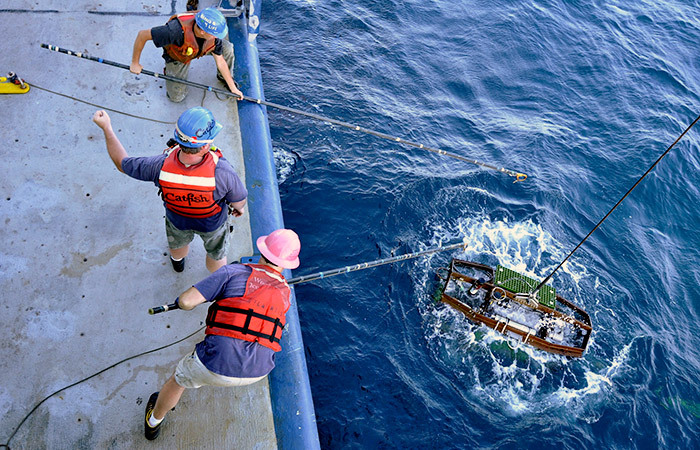 Shortly after bringing samples to the surface, Jason’s crew re-deploys the ROV for its final dive of the expedition. After being raised more than 8,000 feet from bottom of the Pacific, Medea breaks the surface of the water. The long poles pictured here allow Atlantis’ crew to clip ropes to the vehicle, which they’ll use to help stop the remotely operated vehicle from swinging as it comes on deck. 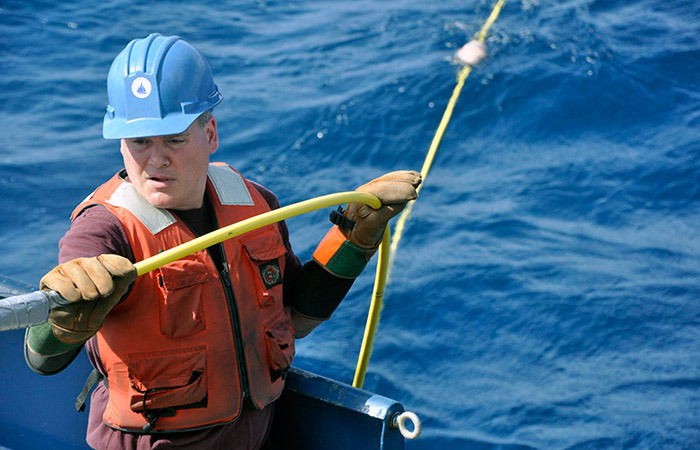 As Jason is lowered into the water, electrical technician Rick Sanger carefully feeds the vehicle’s newly installed tether cable over the side of the ship. Biologist Horst Felbeck begins a dissection of a tubeworm by cutting into the base of its tough outer covering. The incision will help him slide the fragile worm from its tube in one piece. 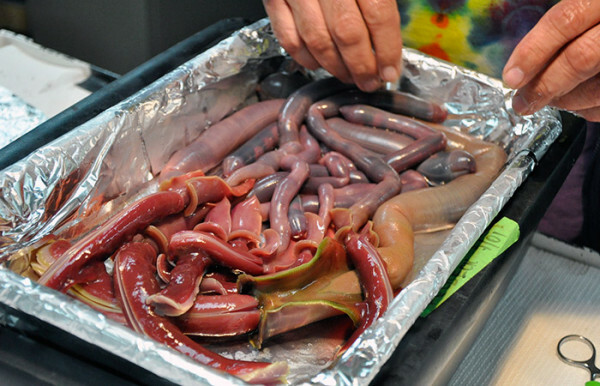 This photo offers an unusual sight: a pile of naked Riftia worms, freshly removed from their protective tubes and ready for dissection. 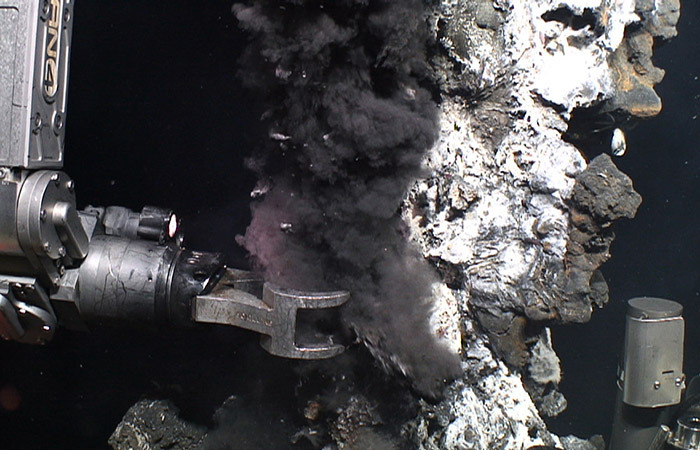 As hot fluid from hydrothermal vents hits the cold water at the bottom of the ocean, dissolved minerals precipitate out as solids, forming "chimneys" like these—and forming a home for countless microbes that thrive on the chemicals that seep out of the vents. Collecting samples of these chimneys isn't always easy, however. As seen here, the structures are quite fragile, and tend to disintegrate when touched. Collecting live tubeworms requires a delicate touch. First, Jason’s pilots need to tap the worm, causing it to duck back into its protective tube. While it hides there, the vehicle’s manipulator arm can safely grab the tip of the tube without harming the worm inside. Take special note of the white flecks in the water nearby—these are actually created by microbes that live inside a vent directly under the worms. As the microbes “eat” hydrogen sulfide, a chemical in the vent fluid, they convert that compound into bits of pure sulfur that collect in the water and create a “snowblower” effect. On a ship made almost entirely of metal, small wooden touches like this sign bearing Atlantis’ name are a welcome reminder of land. 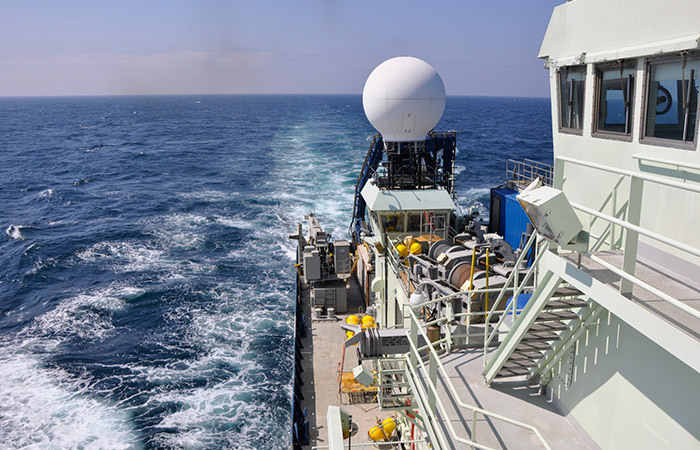 A view looking aft from the bridge of the R/V Atlantis.The round white object in the middle of the image, called a “radome,” houses the satellite antenna that keeps us connected to the internet (making Dive & Discover dispatches possible). 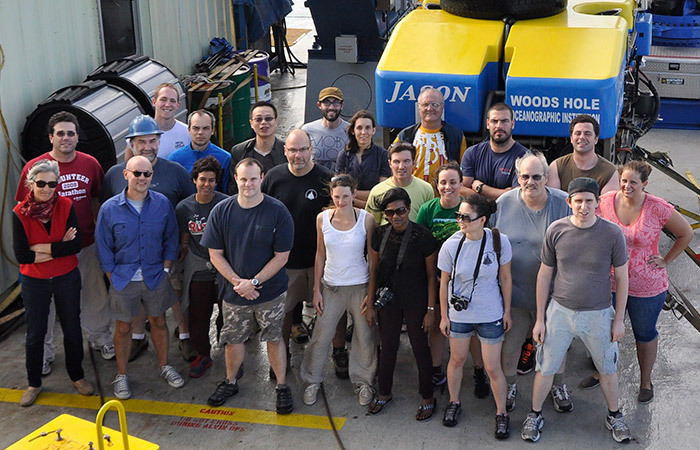 As the expedition draws to a close, the full WHOI science team poses for one final photograph in front of Jason. 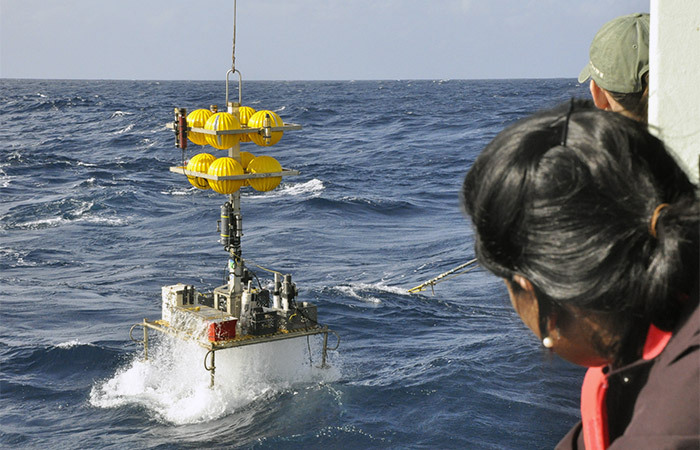 Visit WHOI’s Dive and Discover website to see my complete coverage of the 2014 expedition.